Ever since she was 9 years old, Lucy Shelley has been exposed to and has experienced the wonders of diving and the underwater world. Shelley, a sophomore at Carmel High School and diving enthusiast, says that when she is diving it is unlike anything that can be experienced on land, and the variation of creatures she is able to observe is incomparable to anything else. A close friend of the Shelley family is Monterey Bay Aquarium co-founder and marine biologist Dr. Steve Webster. He has played a key role in Shelley’s diving interests and experiences. When Lucy first traveled to Fiji she served as Webster’s assistant. She recalls learning to dive Dr. Webster’s 4-foot pool before going on her first dive trip in Fiji. Now, a typical dive for Shelley is anywhere from 40 to 80 feet, depending on her nitrox blend. Webster explains that Lucy was certified as a SCUBA diver in Fiji at age 9 and has become a completely relaxed, competent diver. 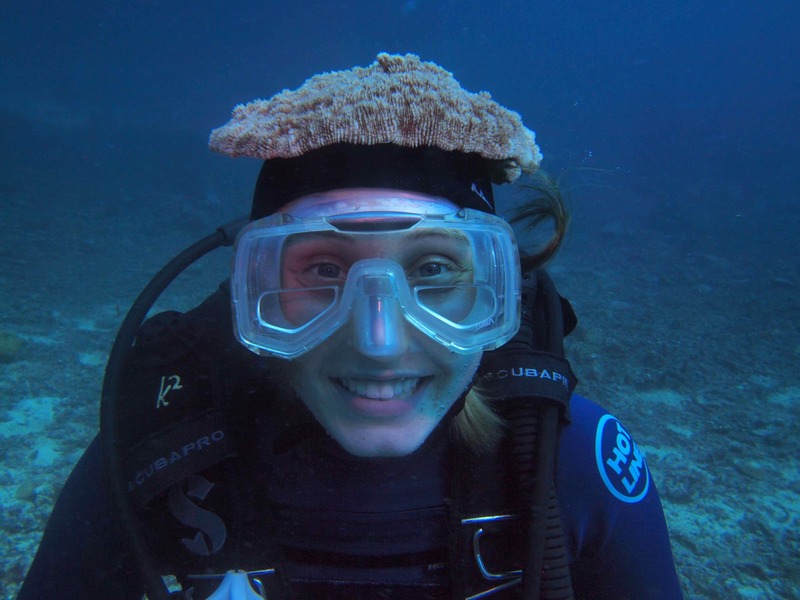 A mushroom coral on her head and use of the GoPro camera for close-ups are good examples. Relaxed, but attentive and safe as well, Webster says. “I’d dive with Lucy anywhere!” the marine biologist says. For Lucy Shelley, Dr. Webster has been an amazing inspiration, not only through experiences but through the marine expert’s knowledge as well. Dr. Webster would lead lectures on the boat following dives, and Shelley would help with orienting cameras, download the pictures and prepare gear which was used on the dive as well. Last summer, Shelley participated in a program at the Monterey Bay Aquarium called the Teen Conservation Leaders. She now consistently volunteers as a volunteer guide working at the various stations within the aquarium. Her most recent trips were in October when she went to Mexico and Fiji in December.